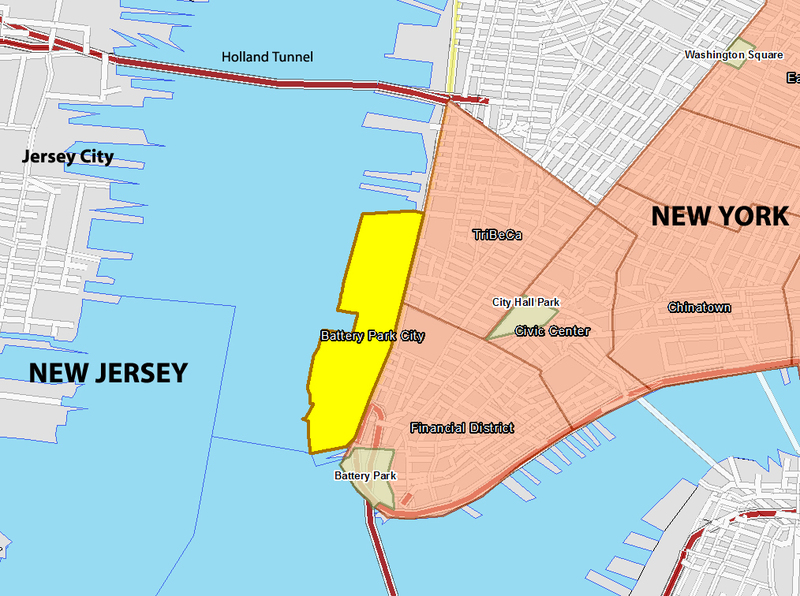 Piers 1 – 23 existed prior to the creation of Battery Park City, created with the construction of the original World Trade Center. The 1943 map above can be also viewed by clicking here: New York Harbor Terminals. 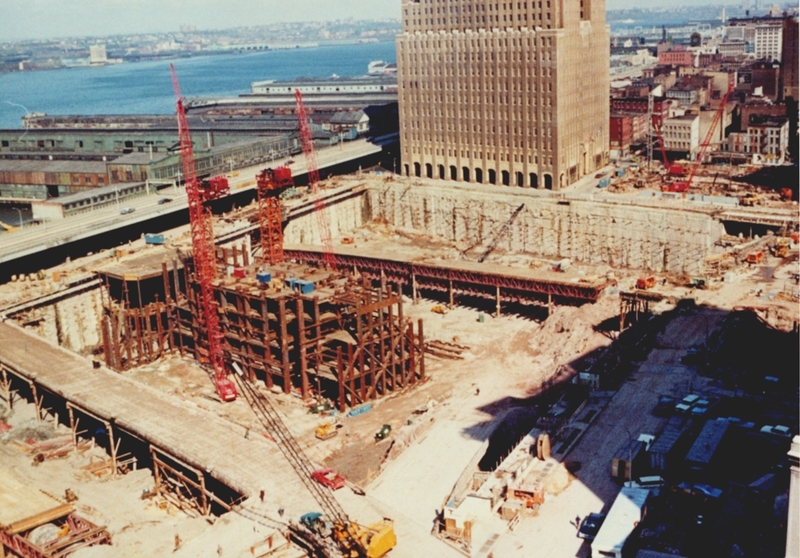 This picture, courtesy of George Tamaro, an engineer who worked on the original WTC construction,depicts construction of the original World Trade Center One, taken in the early 1970s. The sand colored building is the New York Telephone building (today, the Verizon Building) (originally known as the Barclay-Vesey Building, when it opened in 1927), on the north side of Vesey Street. 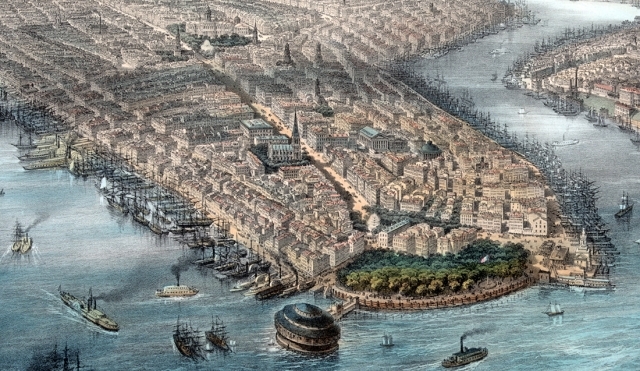 The piers existing prior to the creation of Battery Park are on the leftmost side of the picture. 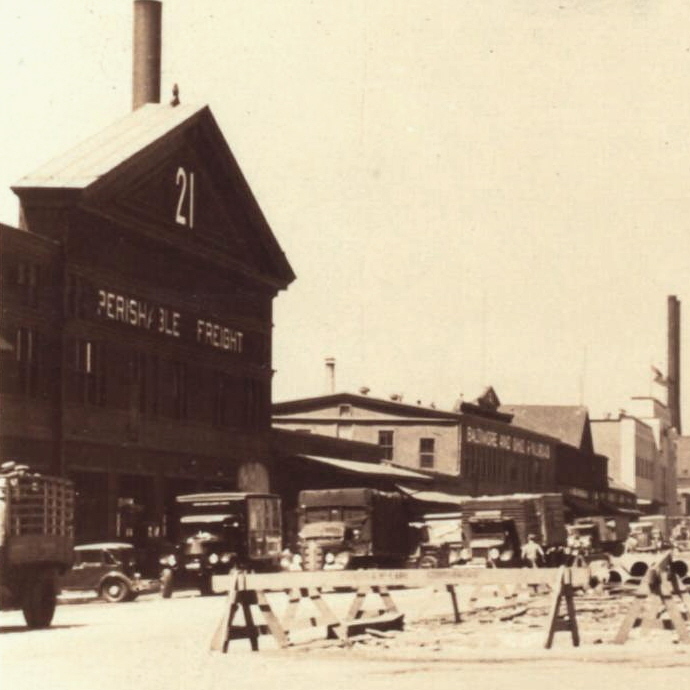 Piers 22 and 23 would be where Battery Park City is today, and were freight piers for the Baltimore & Ohio railroad. Baltimore & Ohio Railroad – Harrison Street Freight Station / Pier 23 & Jay Street Freight Station / Pier 22- unknown date Erie RR Pier 21 / Duane Street facade showing in background above Pier 22 roof. G. Hockaday photographer L. Kilian collection authors collection. Pier 21 would have been where Battery Park City is today (at Duane Street), was operated by the Eric Railroad. 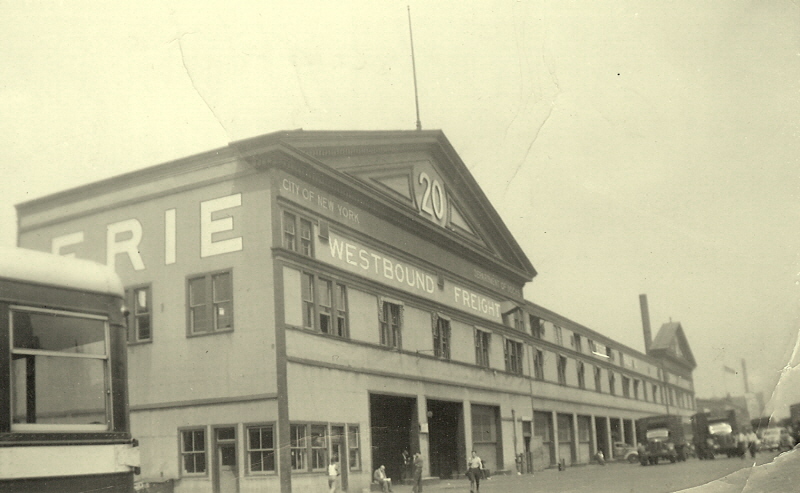 Pier 20 would have been where Battery Park City is today (at Chambers Street), was operated by the Eric Railroad. 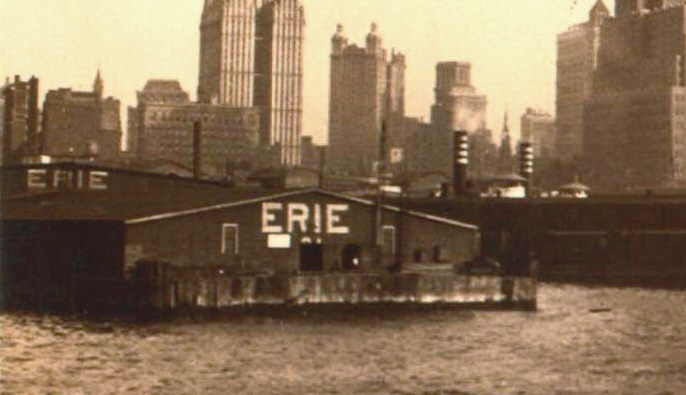 Erie Railroad – Chambers Street Freight Station / Pier 20 – 1942 Homer H. Poss, Jr. photo (Mr. Poss was sightseeing in New York City prior to disembarkation for overseas duty during when he took this image. His daughter, Sherry Fletcher; contacted me and presented this image (along with a photo of the DL&W Ferry “Ithaca”) as gifts. authors collection. Pier 16 would be where Battery Park City is today (at Barclay Street). It was part of the New York Central & Hudson River Railroad. 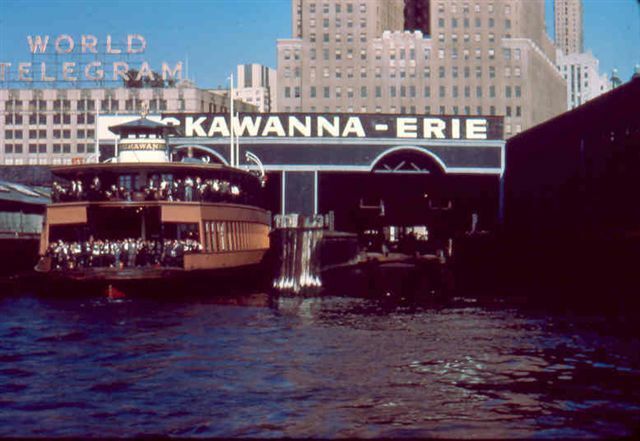 Note that later pictures show the Lackawanna-Erie Ferry terminal at Barclay Street. 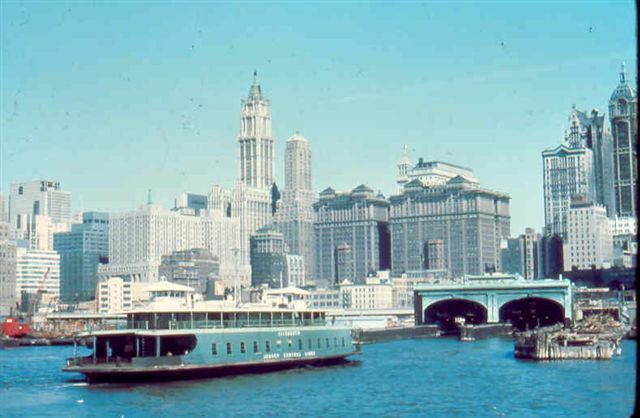 I have not substantiated it, but the ferry pictures, below, would have to have been Pier 16. 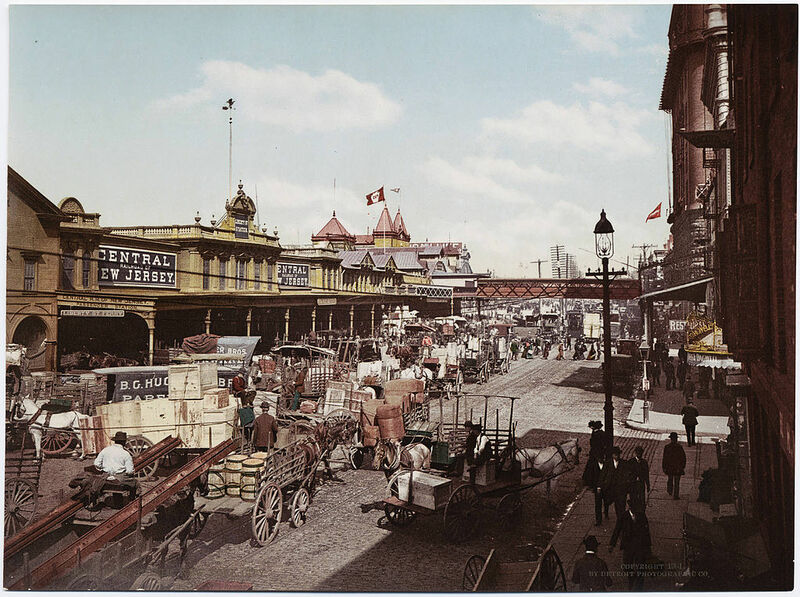 New York Central & Hudson River Railroad – Barclay Street Freight Station / Pier 16 – pre 1900 image courtesy of Joseph De May, Kew Gardens, NY. 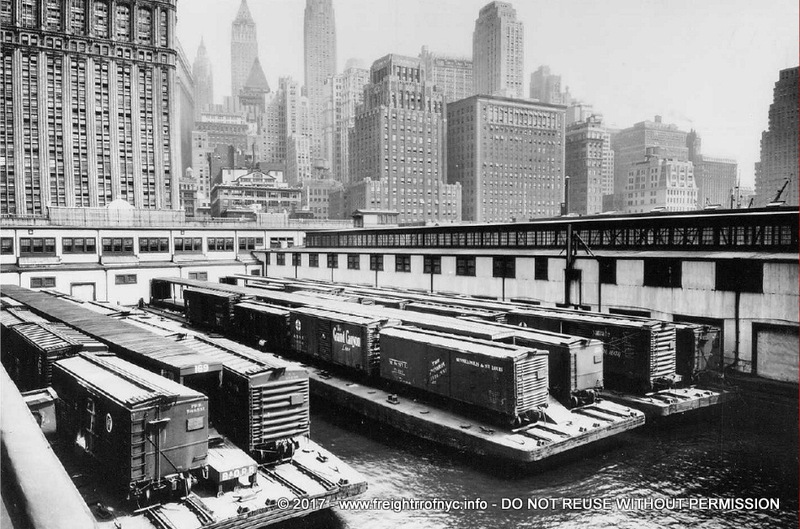 New York Central Railroad – Barclay Street Freight Station / Pier 16 – ca. 1915 Joint Report with Recommendations of the New York & New Jersey Port & Harbor Development Commission. 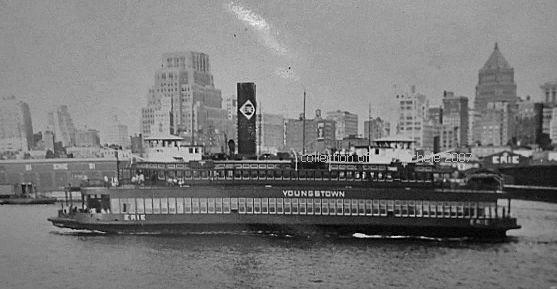 The Erie-Lackawanna Ferryboat LACKAWANNA (1891) leaves Barclay Street on July 31, 1964. She was dieselized in 1949 and in the last years of service, the only non-coal burner in the fleet. 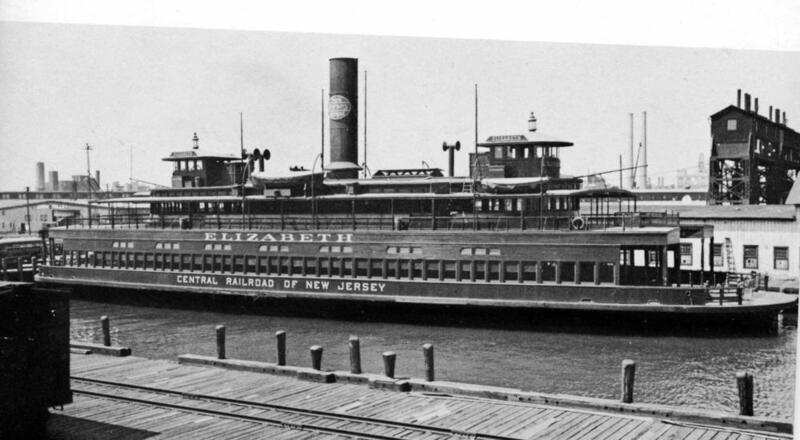 She would make the final passenger sailing at 5:30pm on November 22, 1967 from Barclay Street to Hoboken. 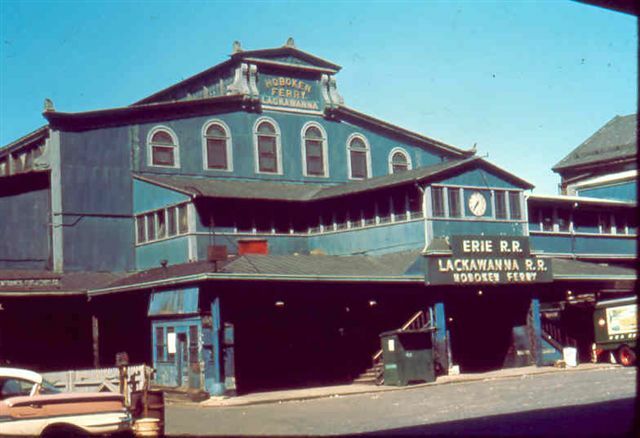 The Erie-Lackawanna Ferry Terminal at Barclay & West Streets, Lower Manhattan, dates from 1884. Ferries left from here to the E-L Terminal in Hoboken, New Jersey. Note the Railway Express truck to the right. (Sept. 1964). 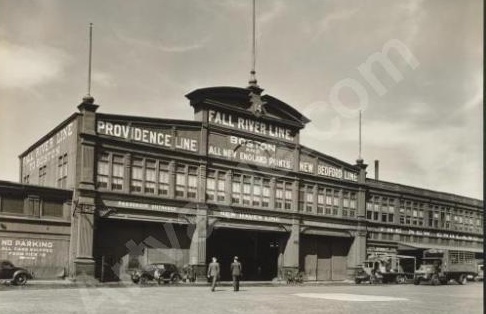 The Fall River Line was a combination steamboat and railroad connection between New York City and Boston that operated between 1847 and 1937. 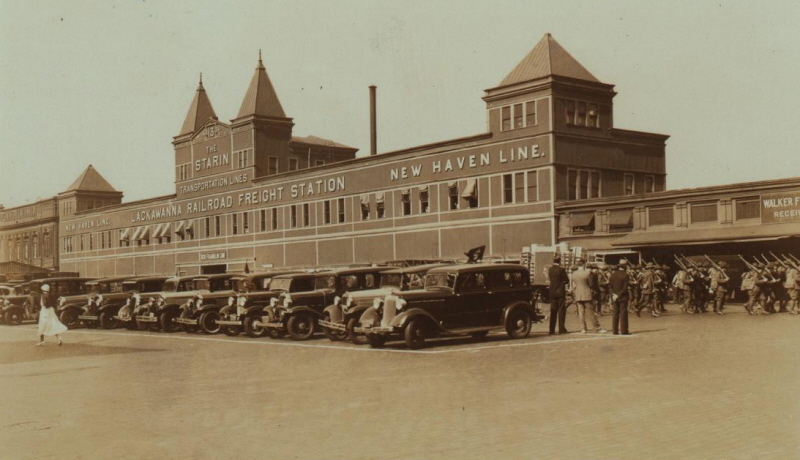 It consisted of a railroad journey between Boston and Fall River, Massachusetts, where passengers would then board steamboats for the journey through Narragansett Bay and Long Island Sound to the line’s own Hudson River dock in Manhattan. For many years, it was the preferred route to take for travel between the two major cities. The line was extremely popular, and its steamboats were some of the most advanced and luxurious of their day. 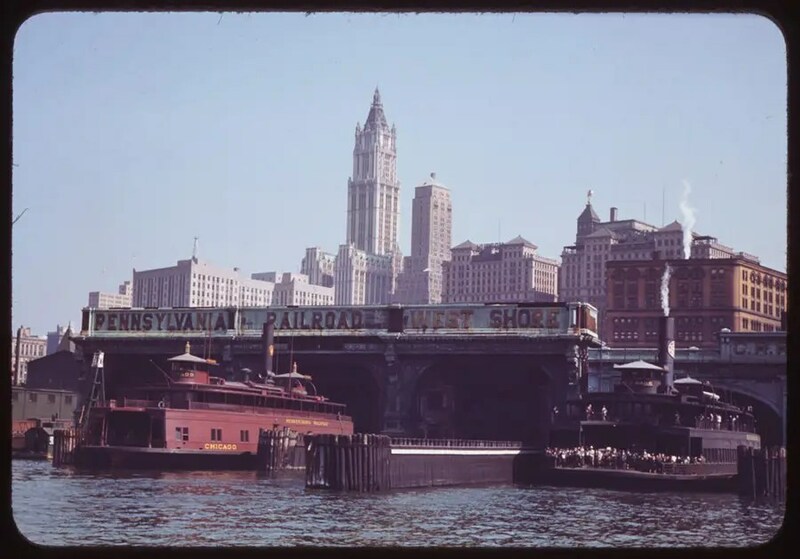 The Fall River Line, a steamboat between New York and Massachusetts, ran until 1937. Pier 14 was located at the foot of Fulton and West Streets. 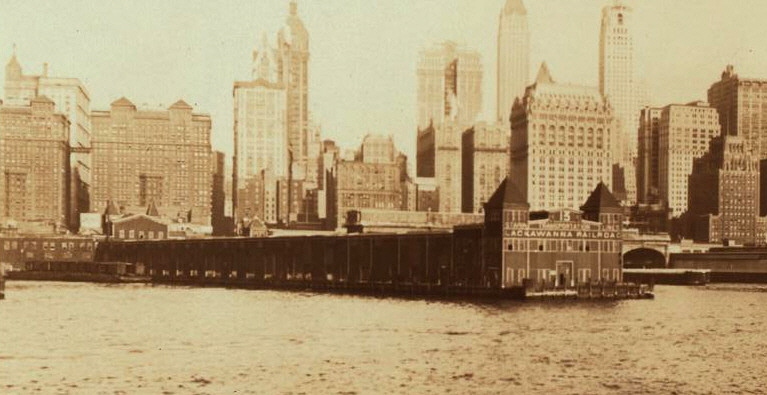 Photo Source: http://fineprintnyc.blogspot.com/2013/01/evolution-of-new-york-city-part-7-1925.html The background includes, left, the New York Telephone building (today, the Verizon Building) (originally known as the Barclay-Vesey Building, when it opened in 1927), to the right, the Woolworth Building. 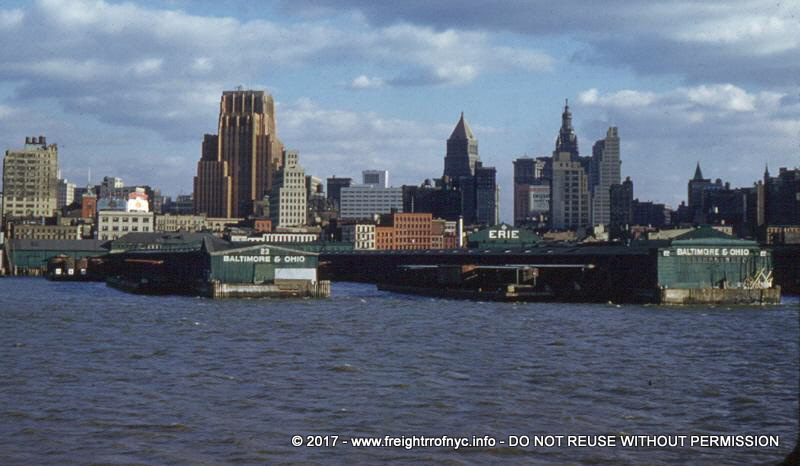 The Delaware, Lackawanna & Western Freight Station located on Pier 13 (Hudson River) was located at the foot of Cortlandt Street. 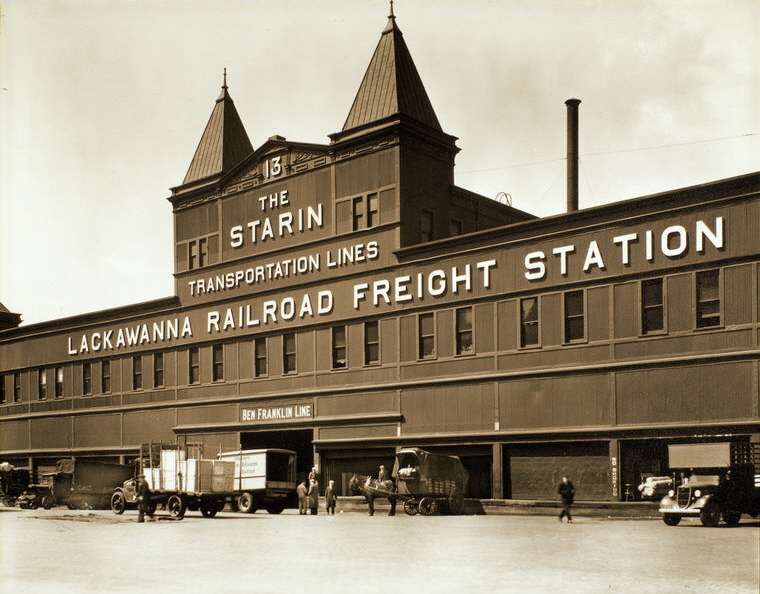 This Freight Station would share space with the Starin Transportation, Ben Franklin and New Haven shipping lines. Delaware, Lackawanna & Western Railroad Freight Station / Pier 13 – July 22, 1931 (looking northeast) P. L. Sperr photo NYPL Digital Archives. Photo source: http://members.trainweb.com/bedt/indloco. 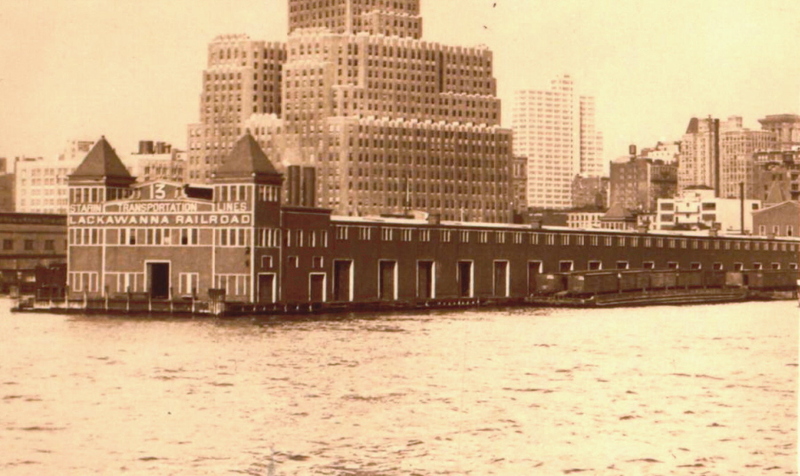 Behind Pier 13, the building is the New York Telephone building (today, the Verizon Building) (originally known as the Barclay-Vesey Building, when it opened in 1927). Delaware, Lackawanna & Western Railroad Freight Station / Pier 13 – August 1, 1933 (note marching troop formation on right edge of photo) P. L. Sperr photo NYPL Digital Archives. 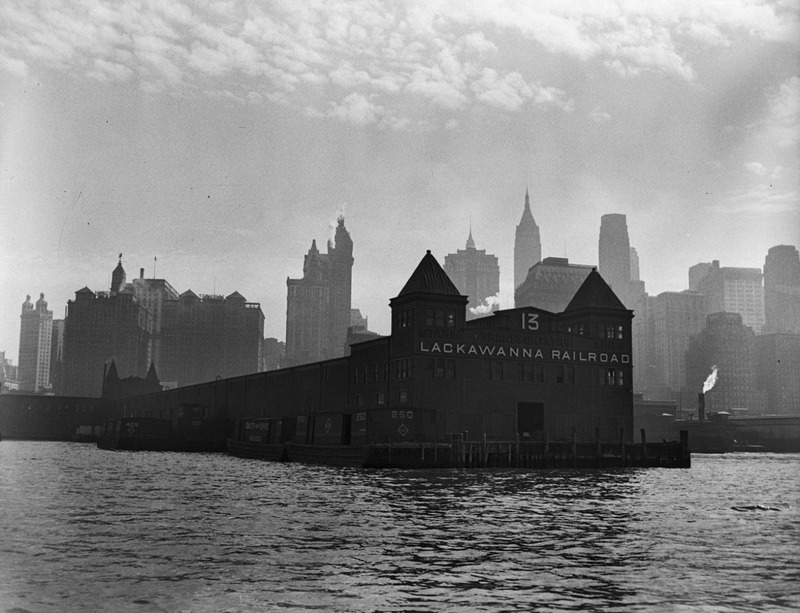 Delaware, Lackawanna & Western Railroad Freight Station / Pier 13 – April 9, 1936 B. Abbott photo NYPL Digital Archives. Delaware, Lackawanna & Western Railroad Freight Station / Pier 13 – August 1, 1930 (looking southeast) P. L. Sperr photo NYPL Digital Archives. The Central Railroad of New Jersey occupied Pier 8 at Albany Street, Pier 10, and Pier 11 at Cedar Street. 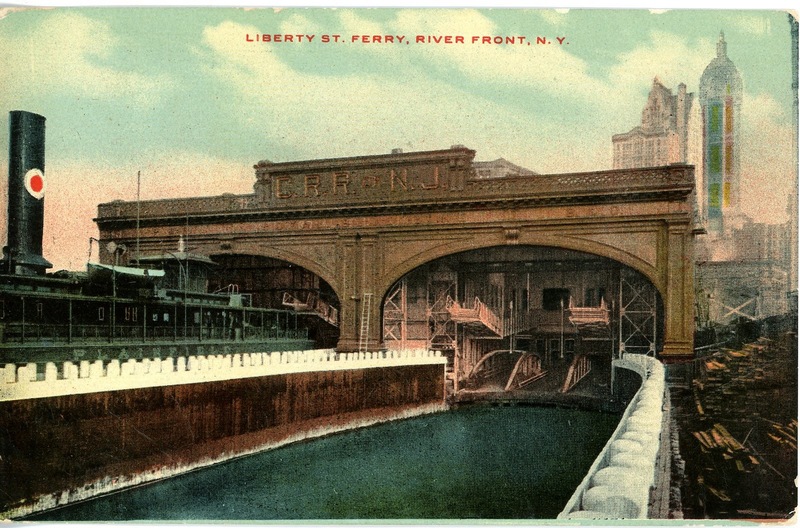 Pier 13 at Fulton Street was occupied by the Delaware, Lackawanna, and Western Railroad (Source: http://members.trainweb.com/bedt/indloco/pierstations.html). I have not been able to ascertain the Pier number at Liberty Street, and thus assume it is Pier 12. Pier 11 would be where Battery Park City is today (at Cedar Street). It was part of the Central Railroad of New Jersey. 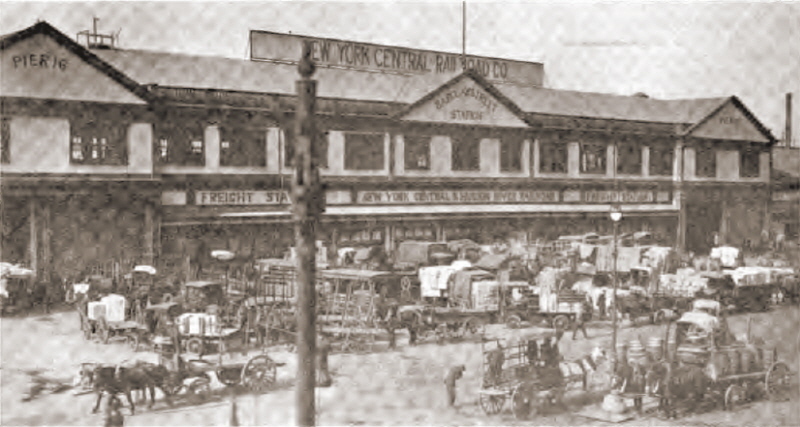 Central Railroad of New Jersey – Cedar Street Freight Station / Pier 11 – ca. 1932 E. Galloway photo NYPL Digital Archives. Pier 10 was at Albany Street and served the Central Railroad of New Jersey. 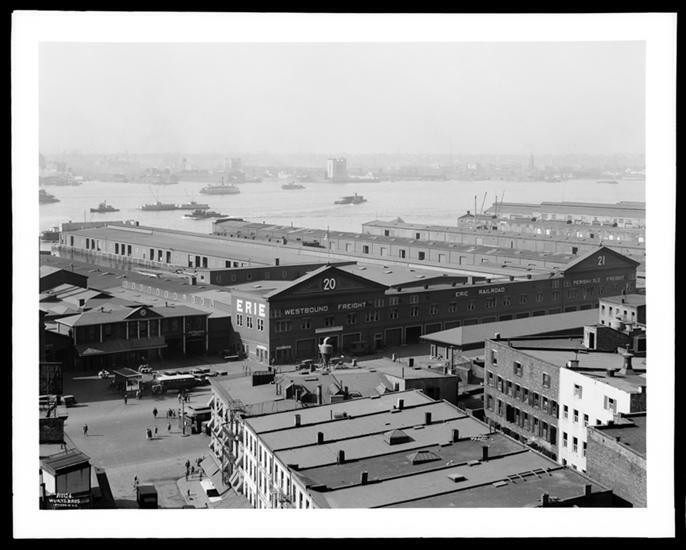 Pier 8 would be where Battery Park City is today (at Rector Street). It was part of the Lehigh Valley Railroad. 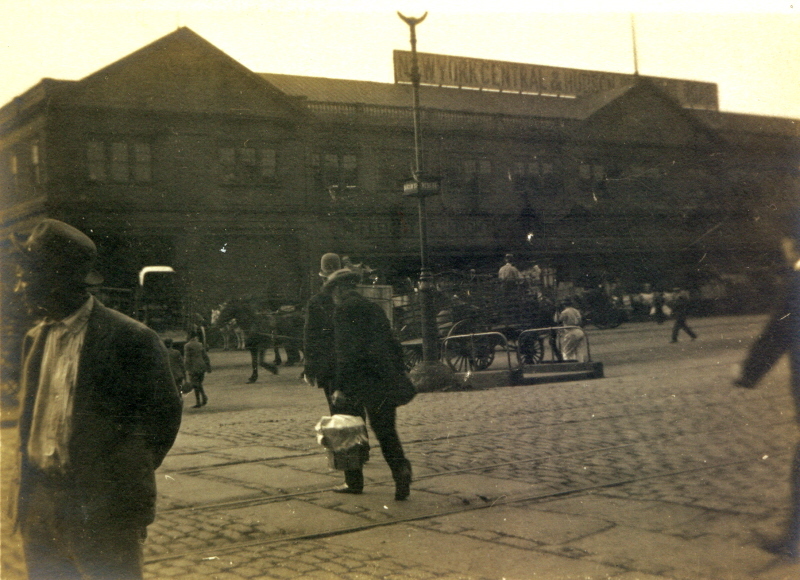 Lehigh Valley Railroad – Rector Street Freight Station / Pier 8 – September 20, 1929 P. L. Sperr photo NYPL Digital Archives. Lehigh Valley Railroad – Rector Street Freight Station / Pier 8 – October 5, 1938 P. L. Sperr photo NYPL Digital Archives. Piers 3, 4, and 5 were at Morris Street and served the Pennsylvania Railroad. 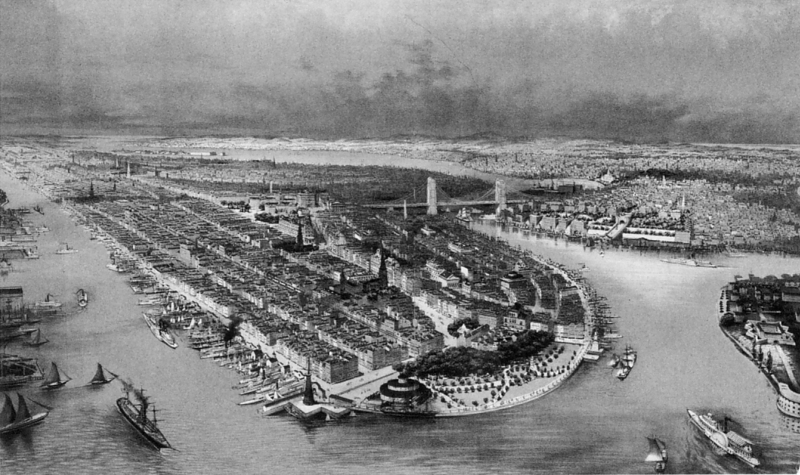 Pier 1 would be where Battery Park City is today (at Battery Place). It was part of the Pennsylvania Railroad. 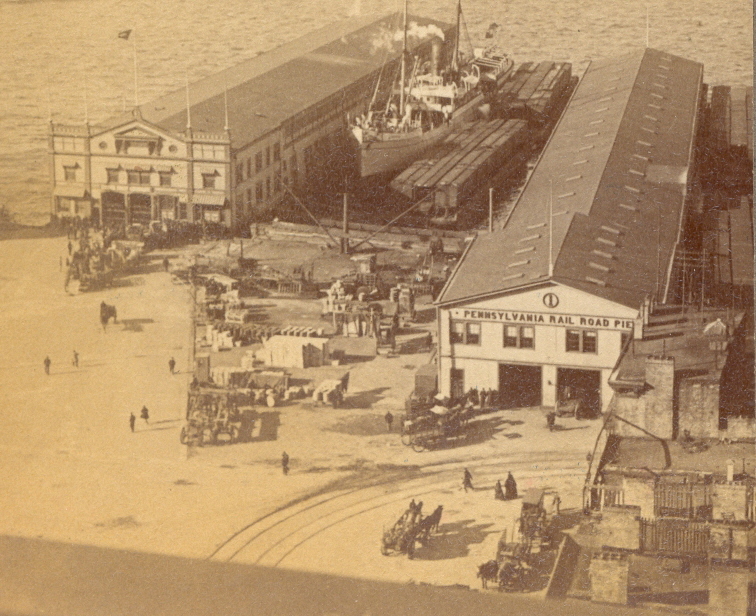 Pennsylvania Railroad Pier 1 / Battery Place Freight Station – Battery Place – ca. 1902 (from an Underwood & Underwood stereoscopic photo) image courtesy of Joseph De May, Kew Gardens, NY. Pier A was originally constructed in 1886 and comprises a three-story building of about 38,725 gross square feet and an adjacent promenade. 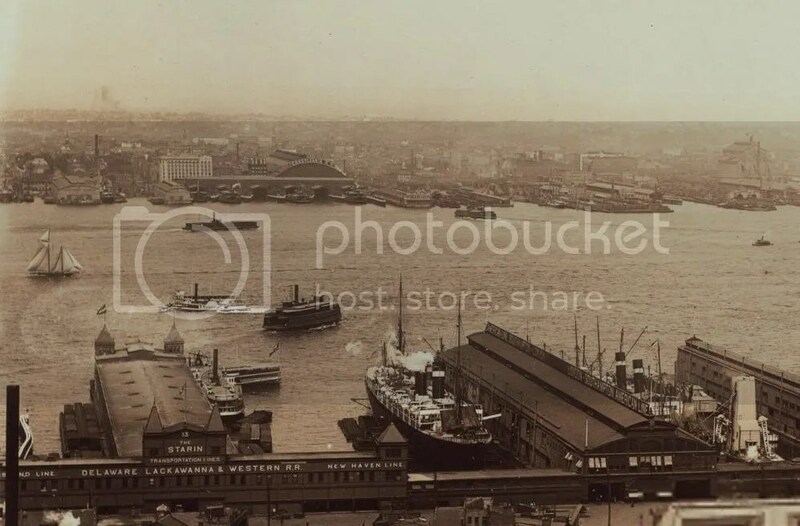 Department of Docks and Police Station, Pier A, North River, Manhattan.. Abbott, Berenice — Photographer. May 05, 1936. Photo Source: Changing New York / Berenice Abbott. (more info). Repository: The New York Public Library. Photography Collection, Miriam and Ira D. Wallach Division of Art, Prints and Photographs. Towing USS Lafayette with view of Hudson River piers, 1945. Amid increasing European hostilities, France’s Normandie sought refuge in New York at Pier 88. 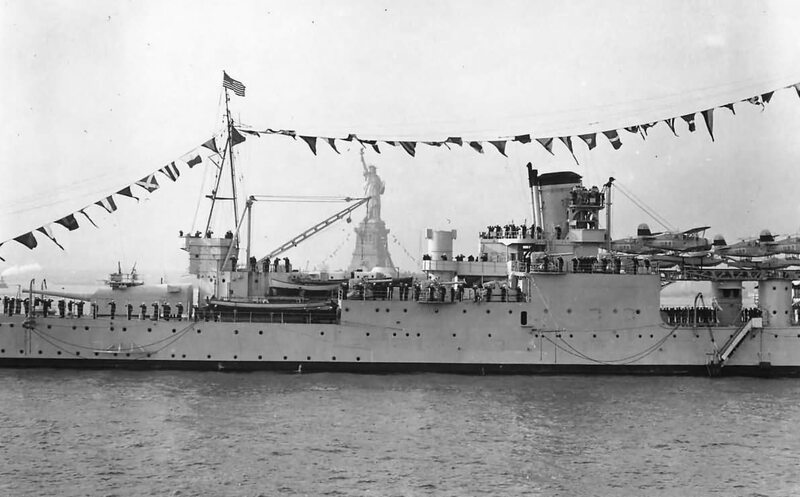 In 1941, the Navy assumed the ship, and changed its name to the USS Lafayette. On the February 9, 1942, a fire broke out and the ship capsized. Although salvaged at great expense, restoration was deemed too costly and she was scrapped in October 1946. The pier with the twin peaks is Pier 13 (at Fulton Street). (Credit: U.S. Navy via the New-York Historical Society). 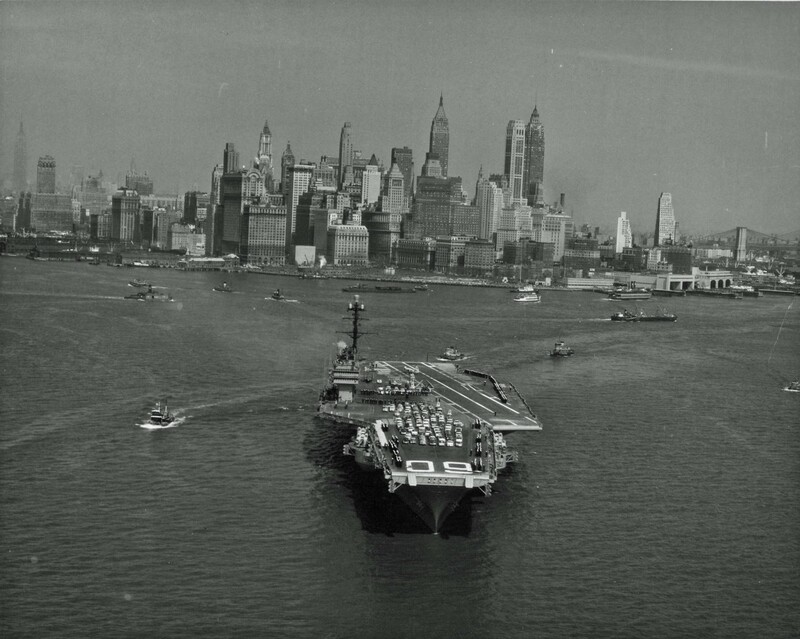 The U.S. Navy aircraft carrier USS Saratoga (CVA-60) departs after a port call in New York City, 1956-1959. Thomas A. Edison took this footage on May 20, 1903.